Today, Rabac is a well-known tourist resort. By the middle of the 19th century, it was a small fishermen village with hardly ten houses. Due to the beautiful bay and splendid, tame surroundings, it soon attracted first visitors. In 1876, Richard Francis Burton, an English writer and a passionate traveler, was among the first tourists who stayed in Rabac. 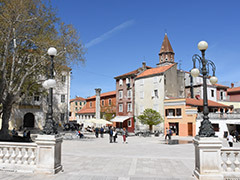 Having seen Rabac and other places on the Istrian coast, he wrote a book of the same title 'The Istrian coast', describing, among other things, the beauties and charm of Rabac.At that time Rabac witnessed the building of the first villas. The most well-known was the villa belonging to the Prohaska family, Czechs by origin, who were distinguished tradesmen from Rijeka. 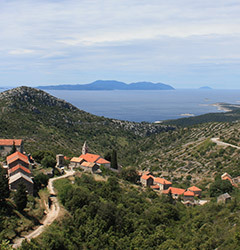 Unfortunately, the villa was destroyed during the Second World War, but one of the most attractive locations in Rabac still bears the name of Prohaska. 'Quarnaro', the first hotel in Rabac, was opened on 11th June, 1889 in the house of the Viskovic family situated close to the present 'Orlando' atelier. The hotel had only a few rooms and a pub on the ground floor.Kaiser, the Austrian officer, who was a regular client of that first hotel, later bought Dubrova, an estate close to Labin. Today, Dubrova is hosting the Mediterranean Sculptors Symposium and is becoming ever more famous for its magnificent park of sculptures.The chronicle writers would point out yet another curiosity - at the beginning of this century in 1907, Prince Ferdinand, the Austro-Hungarian heir to the throne, visited Rabac and was saluted by people who had gathered in the harbor.The inhabitants of Rabac were skilled fishermen, seamen and owners of some ten sailboats which were either destroyed in the maelstrom of the Second World War or pushed back by modern ships. The first larger hotel was built in the period of the Italian government in 1925 in the very center of Rabac and was called 'Trieste' -its name today is 'Primorje'. The capacity of the hotel could not meet the ever growing demand of tourists, mainly from the northern parts of Italy. Hence the more intensive development of private accommodation took place. Ten years after 'Trieste', the 'Dopolavoro' hotel was built - presently the 'Jadran' restaurant.Tourism in Istria, as well as in Rabac, began to develop during the sixties, when this small resort, due to its natural beauty , got the flattering name of 'The Pearl of the Kvarner Bay'. Since then, all existing hotels, apartments, camping sites and the majority of the private houses have been built.Among the visitors, for years now, the most numerous have been Germans and Austrians followed by English and Italians. 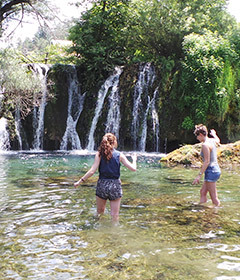 Rabac can accommodate in one day even 11.000 visitors, mainly foreign, and several thousand bathers from Labin and its surroundings.